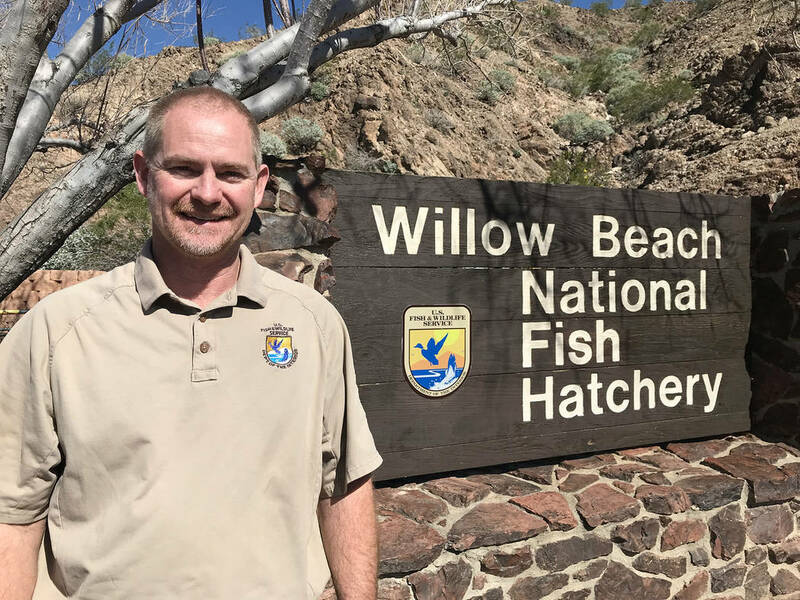 (Hali Bernstein Saylor/Boulder City Review) Kraig Ruebush, seen March 7, 2019, was named manager of the Willow Beach National Fish Hatchery, which is located within Lake Mead National Recreation Area in Arizona about 14 miles below Hoover Dam. 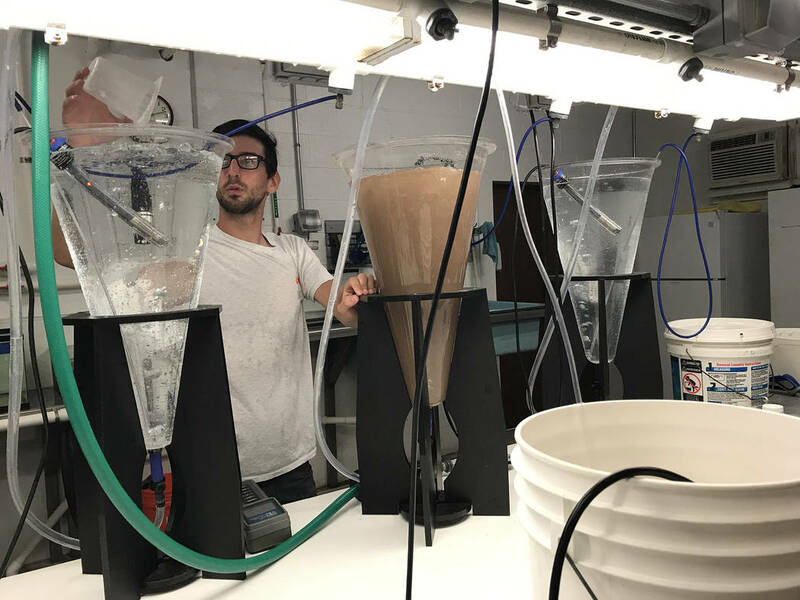 (Hali Bernstein Saylor/Boulder City Review) Evan Mosser, an animal caretaker at Williow Beach National Fish Hatchery, works with artemia, a type of brine shimp that can be hatched on demand, which must be fed to fry, baby fish, every 30 minutes. 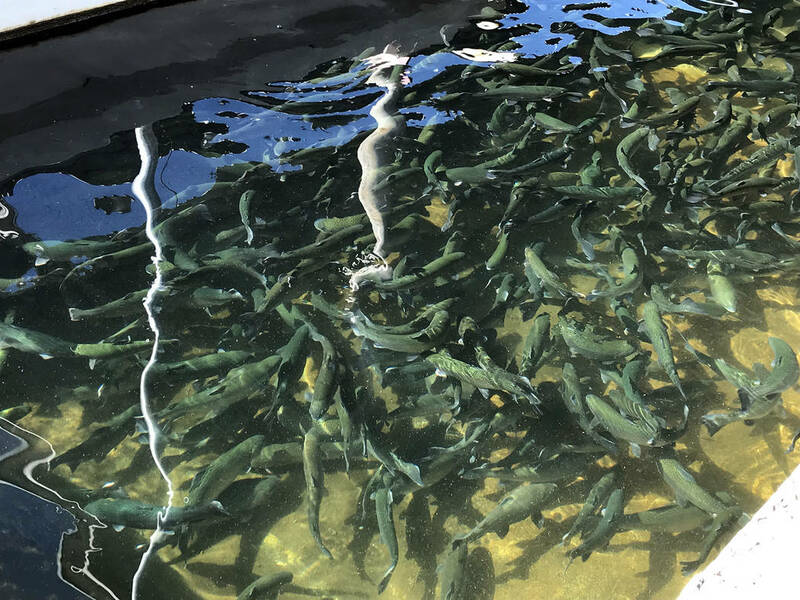 (Hali Bernstein Saylor/Boulder City Review) Rainbow trout, seen March 7, 2019, are raised in raceways at the Willow Beach National Fish Hatchery until they are between 10 and 12 inches long and large enough to be released into the Colorado River inside Lake Mead National Recreation Area. 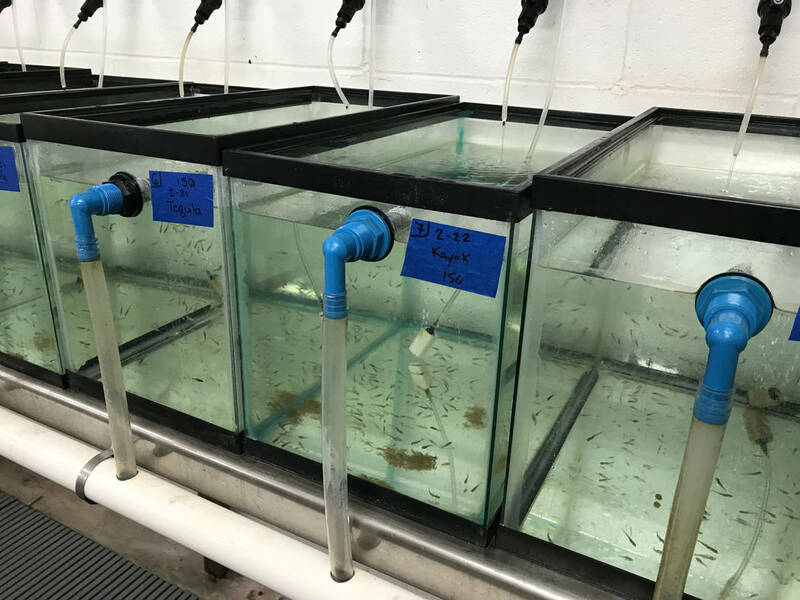 (Hali Bernstein Saylor/Boulder City Review) Fry, or baby fish, in various states of development are housed inside the Willow Beach National Fish Hatchery in Arizona. They must be fed every 30 minutes until they are large enough to be transferred to other tanks and outdoor raceways. 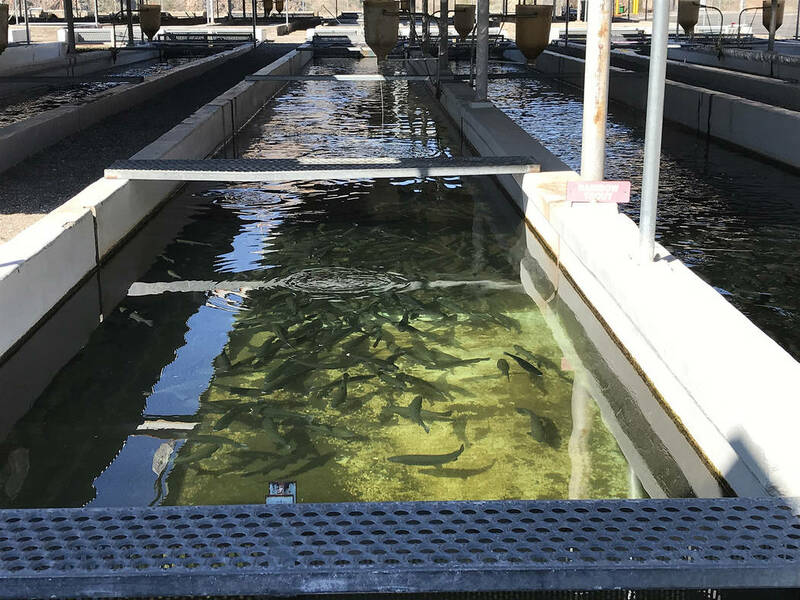 As the new manager of the Willow Beach National Fish Hatchery, Ruebush is well-aware of the release scheduled of the rainbow trout raised at the facility about 14 miles downriver of Hoover Dam in Arizona. Just in case you’re wondering, it’s Friday morning. Each year, about 100,000 trout are released from the hatchery, about 45,000 each from Willow Beach and Davis Camp below Davis Dam during the winter months and 10,000 into tribal waters. Ruebush said it takes about one year to raise trout from fry to about 10-12 inches, which is the size law mandates they can be released. With trout, the hatchery inside Lake Mead National Recreation Area raises razorback suckerfish, an endangered species native to the Colorado River. At any given time, there are about 200,000 fish in various stages of development at the hatchery. Ruebush, who was named manager in February, said it is his goal to make sure his staff has what it needs to take care of the fish and reach its goals. “It’s different growing up on a farm in the middle of Illinois to raising fish in the desert,” Ruebush said. Ruebush said the hatchery is essential to the fish population, especially the razorbacks, because construction of Hoover Dam changed the river’s ecosystem, making the water artificially colder in the process used to create hydroelectricity. The hatchery, under the jurisdiction of the U.S. Fish and Wildlife Service, has been in operation since the 1960s. There are eight people working at the hatchery, most of whom are relative newcomers like Ruebush. There is one biologist who has been there for about 10 years, and the remainder have joined the staff in the past year. Ruebush’s love of fish and fishing stems back to his childhood when he father took him fishing every summer at a lake near their home in Macomb, Illinois. He joined the Army after graduating from high school, where he learned to operate heavy machinery. He worked with a construction company after his military service in Hudson, Wisconsin, where he met his wife. His love of the outdoors and seasonal nature of construction prompted him to enroll at the University of Arkansas at Pine Bluff and get his bachelor’s degree in fisheries. After graduating, Ruebush went to a commercial catfish farm in Oklahoma. He also had stints at a catfish farm in Northern California, which also produced trout, and at a salmon hatchery in Washington, and he raised walleye pike in North Dakota. He was at seven hatcheries within a 2½-year span. Though he was surrounded by fish, Ruebush didn’t have much opportunity to enjoy the sport, until recently. A fellow alum from the university, Trevor Luna, serves as the hatchery’s assistant manager. He oversees fish production. Luna worked at the world’s largest catfish farm in Mississippi before joining the Fish and Wildlife Service. “Fishing gets you hooked,” he said. Luna grew up in south Florida, which he called the sport fishing capital of the world. He also spent a great deal of his childhood in Nebraska, with his mother’s family. He also spent time in Zambia with the Peace Corps raising tilapia and helping people learn how to provide food for their families. Ruebush said the staff’s diverse background with different fish and in private industry has allowed them to take those skills and apply them to operations at the hatchery. He said the job is very rewarding, especially when he sees the smiles on the faces of those who see and catch the fish they are raising. In addition to supervising all activity at the Willow Beach facility, Ruebush oversees the Achii Hanyo Native Fish Rearing Facility, a satellite site on lands of the Colorado River Indian Tribes, approximately 5 miles southwest of Parker, Arizona. Endangered bonytail chub and razorback sucker are raised there. Tours of the hatchery are available during regular hours, 7 a.m. to 3 p.m. Monday through Friday.